Click here to view the 2019 Spring Term curriculum. The children in Year 4 have designed and made a model of a submarine! They were inspired by Cornelius Drebble (1572-1633), inventor of the first navigable submarine. They were amazed to see how technology has developed over the years. They also incorporated electrical systems in their models. It was wonderful to see how well the children co-operated when working on their models. Today Year 4 started to write a story. Can you guess where it might be set? Today the children experienced handling and exploring a range of sea creatures. They then developed their artistic skills to draw their favourite. Thank you all so much for supporting our special day. The children all look fantastic and have absolutely loved learning about the Ancient Romans. I would like to welcome you and your children to Year 4. We are looking forward to a busy and enjoyable year. We have many opportunities planned to engage and excite the children to help them enjoy all of their learning. Children will take part in daily Maths, English and Spelling lessons. They will also participate in RE, PE, Science and Spanish lessons throughout the week. All other subjects will be taught through our Imaginative Learning Projects. These projects allow children to develop their knowledge and skills in a creative and engaging way. Your child will be given a reading book and a reading record for you to comment in. Mrs Fisher and I will write comments in the book to help you and your child know what they need to do to develop their reading skills. Please try to listen to your child read for 10 minutes every night and write a comment in your child’s reading record. This will really help your child to become a confident, fluent reader. I am passionate about reading and I can’t wait to share lots of stories with the children this year and help them to develop as readers. Your child will receive homework every Friday. Please try to support your child in completing their homework and returning their book to school by the following Wednesday. Our PE days will be on Tuesdays and Wednesdays and children will need to have the correct kit. The children have settled into Year 4 really well already and I am excited to see how they grow and develop over the coming year. There are a lot of exciting challenges ahead of us, including new books to read, new friends to make and new skills to master… I look forward to you sharing in those times and I am really looking forward to getting to know you and your children this year. If you have any concerns or questions, please do not hesitate to talk to me. Please click here to see our overview of the curriculum for the Autumn Term. 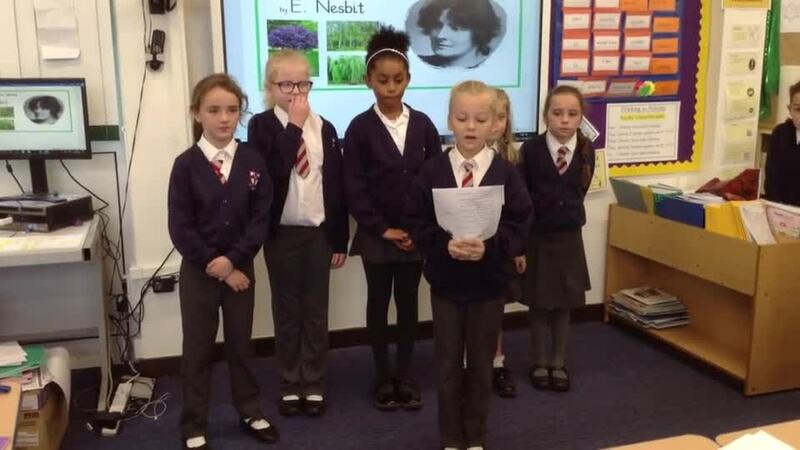 To celebrate National Poetry Day, Year 4 learnt a poem to recite. They also enjoyed learning about the different trees named in the poem.